^ Kiley, Don. "The Tiltrotor. Aviation's square peg?". Flight Safety Information Journal Archived September 7, 2008, at the Wayback Machine.. Special Edition, July 2003. Accessed on 26 October 2008. ^ Miller, Jay. "Origin of the Species". Air & Space/Smithsonian, July 2004. Accessed: 17 March 2012. ^ Maisel 2000, pp. 130 – 132. ^ a b Warwick, Graham. "Tilting at targets" page 44 Flight International, February 1992. Accessed: 4 January 2014. Maisel, Martin D., Demo J. Giulianetti and Daniel C. Dugan. 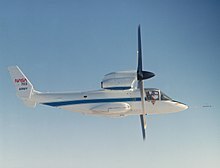 NASA SP-2000-4517, "The History of the XV-15 Tilt Rotor Research Aircraft: From Concept to Flight" (PDF). NASA, 2000. Markman, Steve and Bill Holder. "Bell XV-15". Straight Up: A History of Vertical Flight. Atglen, PA: Schiffer Publishing, 2000. ISBN 0-7643-1204-9.